Poetry of a Hobo Mama is a collection of parenting poems I wrote from the time we were preparing for Mikko through watching him grow to three years old. I consciously included poems that spoke of our natural parenting journey — breastfeeding, the family bed, and natural birth among them. And, yes, that is a picture of newborn Mikko and me nursing in public on the front cover! "April Poem-a-Day Challenge so far"
"Losing a baby, in poems"
— too loud? — he stirs. the strain to capture your thoughts in the dark. Does anyone else like how poetically that rhymes? Rita Dove was named Poet Laureate in 1993 and has received the Pulitzer Prize for Poetry. Mother Love uses the ancient Greek myth of Demeter and Persephone to explore the connection between mother and daughter — the beauties and turmoil of that relationship — in a skilled and unsentimental handling. I wanted to share one of my favorite Rita Dove poems, even though it's not from that book. Hope that's allowed! Copyright © 1983 by Rita Dove. You can purchase Mother Love, by Rita Dove, at Amazon ($10.04 right now and eligible for free Super Saver Shipping) and Barnes & Noble (currently $11.92 and eligible for free shipping). 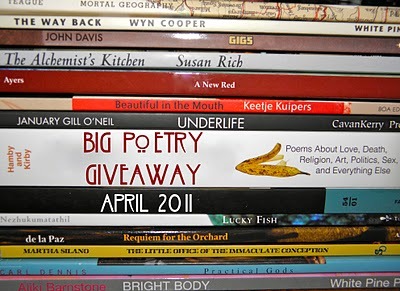 For your own chance to win up to two poetry books, enter in this simple Google form below! Contest is open worldwide. The grand prize winner will win BOTH Poetry of a Hobo Mama, by Lauren Wayne, and Mother Love, by Rita Dove. The second-place winner will receive Poetry of a Hobo Mama. MAIN ENTRY: Simply leave a comment in the Google form! Yes, it's that easy. Leave a valid email address in the form so we can contact you if you win. Email addresses are not made publicly visible. Tell us one of your favorite poets. Link to a poem you love online — your own or someone else's — so we can all enjoy it. Join me in the April Poem a Day Challenge. Yes, it's all right if you're starting partway through the month! Tell me whether you prefer the Google form or comment entry system and why. Follow www.HoboMamaReviews.com through Google Friend Connect, or subscribe to the Hobo Mama Reviews RSS feed in a reader or by email (1 entry for each). Post this giveaway on your Facebook page or wall and leave the link (up to 5 times total, at least 24 hours apart). You can use this status update: Let's celebrate National Poetry Month! 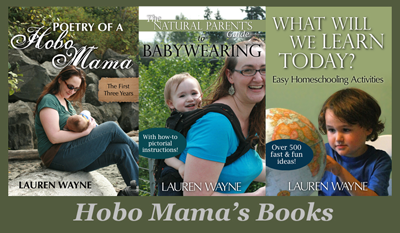 Win up to 2 parenting-related poetry books from @Hobo Mama. Contest ends April 30 and is open WORLDWIDE. Enter another of Hobo Mama's current giveaways (1 extra entry per giveaway — check back for more). 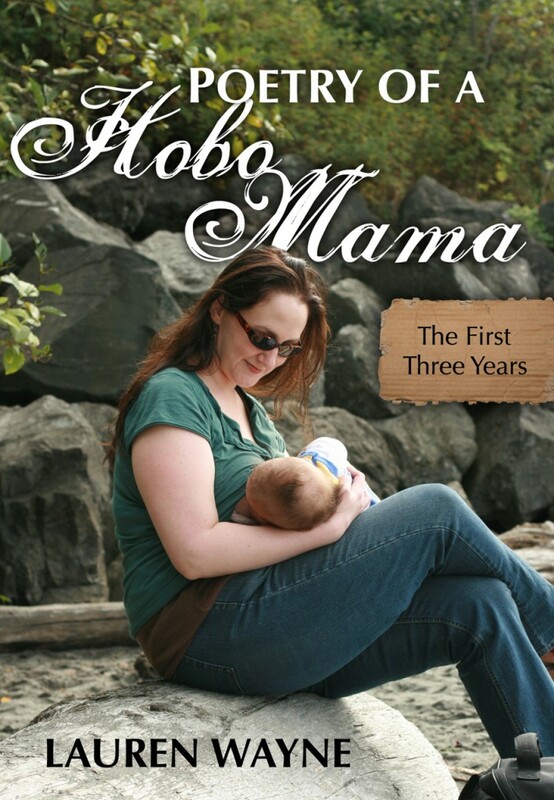 Put the Hobo Mama button on your website or add http://www.HoboMama.com to your text blogroll for 2 extra entries each. The HTML code is in the sidebar of HoboMama.com. You may resubmit the Google form for additional entries like Tweeting and updating on Facebook as needed. For actions like following and subscribing, if you already follow or subscribe, that's fine — just check it off. You don't have to do any of the bonus entries, and since the mandatory one is so simple, any comment will count as your first entry. Since I'm trying out the Google form for the first time, I will allow comments still on the post — either entries or just general chatting! If you do enter in the comments, please don't duplicate entries in the form, and make sure to leave an email address. I will pick the winner through Random.org after the contest closes and send an email notification. Leave a valid email address in the form so I can contact you if you win. If I can't reach a winner or don't hear back within a couple days, I'll draw a new name. Contest closes April 30 at 11:59 p.m. PST. I included a link to a favorite poem of mine, but after submitting noticed errors in it. Here is a better link. I performed the poem at competitions when I was in the 7th grade. It was a fun poem to do!